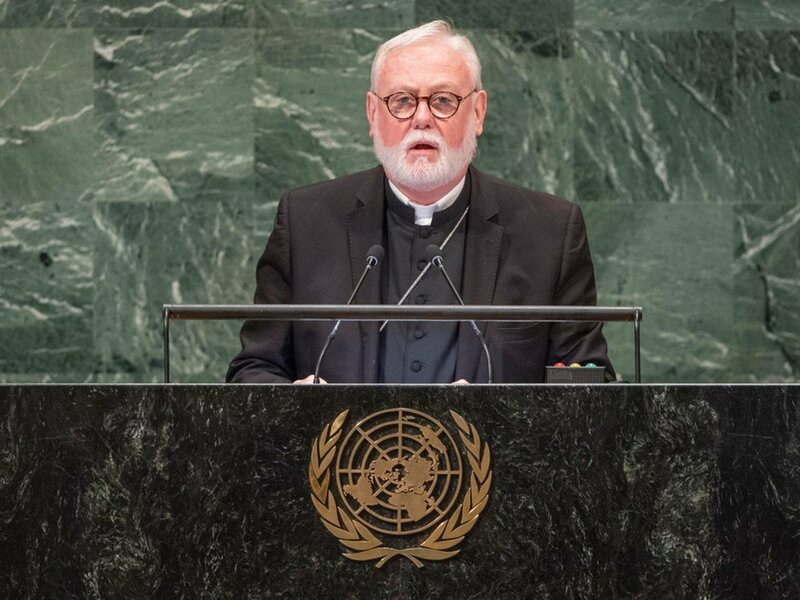 Archbishop Paul Richard Gallagher, Secretary for Relations with States of the Holy See, addresses the seventy-third session of the United Nations General Assembly. “It is worth recalling here Pope Francis’ words: ‘a society without proximity, where gratuity and affection without compensation – between strangers as well – is disappearing, is a perverse society’,” said Archbishop Paul Richard Gallagher, the Secretary of relations with States of the Holy See, addressing the UN Assembly’s annual debate. “The same dehumanization occurs when people are reduced to the crimes they may have committed, the country to which they belong or to their productive capacity,” he added. Archbishop Gallagher noted the importance of the Global Compact for Safe, Orderly and Regular Migration, to be adopted later this year in Marrakech, and said that together with the Global Compact on Refugee, they provide vital protection for those forced to flee their homes for a number of reasons and whose fundamental human rights are at most risk. “The Holy See hopes that the Global Compacts will serve as useful tools for good migration management at every level and a common resource for achieving our shared responsibility in front of the plight of refugees, as well as reference points for international cooperation in the management of migration and the care for refugees,” he said. The senior Holy See official also drew attention to the suffering of civilians in amidst myriad conflicts around the globe and urged States to honour their ‘responsibility to protect’, and highlighted importance of reconciliation and peacebuilding to resolve conflicts. “Forgiveness is not opposed to justice, but it is rather its fulfilment, since it leads to the healing of the wounds that fester in human hearts while acknowledging the evil that has been committed,” he added, urging all religions to assist in the reconciliation efforts. The Archbishop called for promoting equality in rights as well as the full and equal participation of women and men in society. He also outlined the challenges posed by poverty as well as from the impacts of climate change, urging “all efforts” towards achieving the Sustainable Development Goals (SDGs) and the Paris Agreement on climate change. In that context, he expressed Holy See’s hope that the upcoming Conference of the Parties to the UN Framework Convention on Climate Change (COP-24), to be held in Katowice, Poland, will help reinvigorate action in support of the Paris Agreement. “While care for our common home benefits us, it is also a gift to future generations, sparing them from paying the price of environmental deterioration and ensuring that they are able to enjoy its beauty, wonder, and manifold endowment,” he said.